THE MERCATO CENTRALE FOOD MARKET SCENE COMES TO MCKINLEY HILL, TAGUIG STARTING DECEMBER 12! Great foodie news to everyone who works and lives in Mckinely Hill, Taguig! 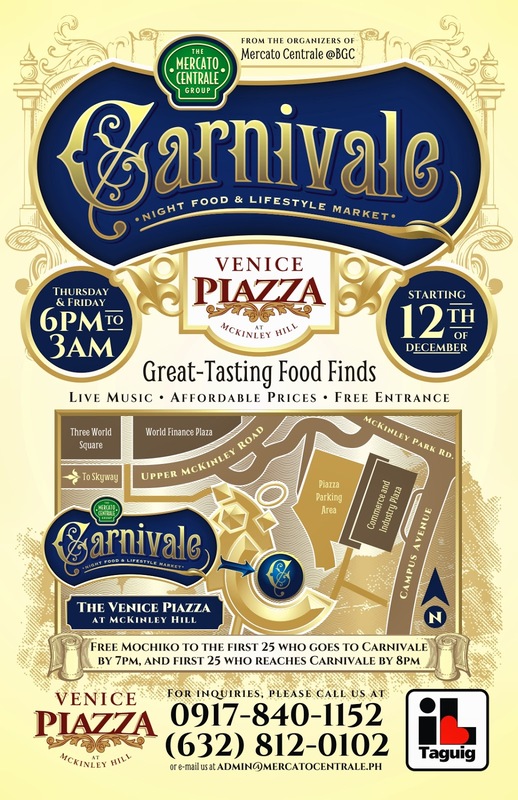 The Venice Piazza Mall at McKinley Hill is home to CARNIVALE - the newest night food market by the MercatoCentrale group! CARNIVALE will be open every Thursday and Friday starting December 12(Thursday) 6pm to 3am starting December 12 (Thursday)! The newest MercatoCentrale market will be celebrating its grand opening with live circus acts and acoustic bands. On top of that, CARNIVALE will be giving away 25 FREE Mochiko ice cream balls to first set of customers who come at 7pm and another set of 25 FREE Mochiko balls to those who come at 8pm. Venice Piazza is located inside McKinley Hill in Fort Bonifacio, Taguig City. McKinley Hill is bounded by C5 to the East, the American War Memorial to the North, Lawton Road to the West (which leads to the airport) and the Philippine Army Headquarters to the South. The MercatoCentrale group, which also runs the Levante food market in Eastwood, has been the birthplace of many fast-growing Manila-based food businesses like Manang’s Chicken, Mochiko, Merry Moo Premium Ice Cream, Spring by Ha-Yuan, Kristina’s Inutak, Chuck’s Grubberie Fish and Chips and many more. For interested food vendors who want to join CARNIVALE, please contact (+63 917) 840-1152or (+632) 812-0102, email admin@mercatocentrale.ph or visit www.facebook.com/elsur.